Our area got yet another dusting of snow and sleet Sunday, and some areas may end up with one to four inches of accumulation, especially on grass. The snow started in higher elevations and in communities to the north and west, but by the afternoon it was falling throughout much of the snow-weary D.C. area. The snow and sleet made roads treacherous in places. Drivers and pedestrians should watch for slick spots on pavement, especially west of D.C.
A winter weather advisory was in effect until midnight for Montgomery County. Another advisory, for Frederick County in Maryland and Loudoun and northern Fauquier counties in Virginia, was ended Sunday night. Frederick County declared a snow emergency Sunday afternoon, but lifted it by 5 p.m.
New4's Darcy Spencer talked to Montgomery County residents about the surprise snow fall in late March. Those areas could see one to four inches before the wintry mix moves on, said Storm Team4 Meteorologist Amelia Segal. The wintry weather could lead to a slippery commute Monday morning, when temperatures in the region are likely to hover around freezing. Snow and sleet are falling throughout the Washington area. 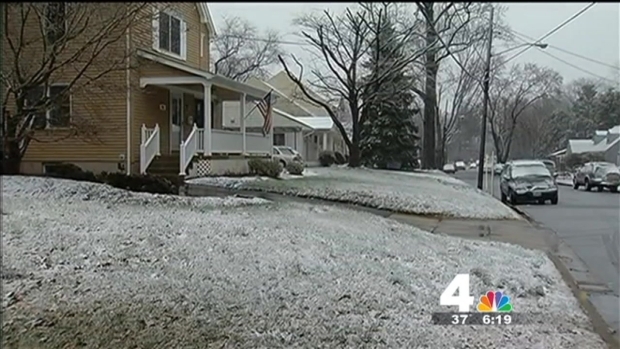 Storm Team4 Meteorologist tells you how much you may see -- and when the wintry mix will end. The region also is seeing rain and increasing wind, bringing a risk of scattered power outages. The wet ground and strong winds raise the risk of trees being blown into power lines, said Storm Team4 meteorologist Chuck Bell. The nasty weather has already led to the postponement of the Nats preseason game Saturday and the Cherry Blossom Kite Festival. For the complete forecast, click here.